This example shows how to linearize a Simulink® model at the operating point specified in the model using the Linear Analysis Tool. The Water-Tank System block represents the plant in this control system and includes all of the system nonlinearities. To specify the linearization input, right-click the output signal of the PID Controller block, and select Linear Analysis Points > Input Perturbation. To specify the linearization output, right-click the output signal of the Water-Tank System, and select Linear Analysis Points > Open-loop Output. An open-loop output point is an output measurement followed by a loop opening, which removes the effects of the feedback signal on the linearization without changing the model operating point. When you add linear analysis points, the software adds markers at their respective locations in the model. For more information on the different types of analysis points, see Specify Portion of Model to Linearize. 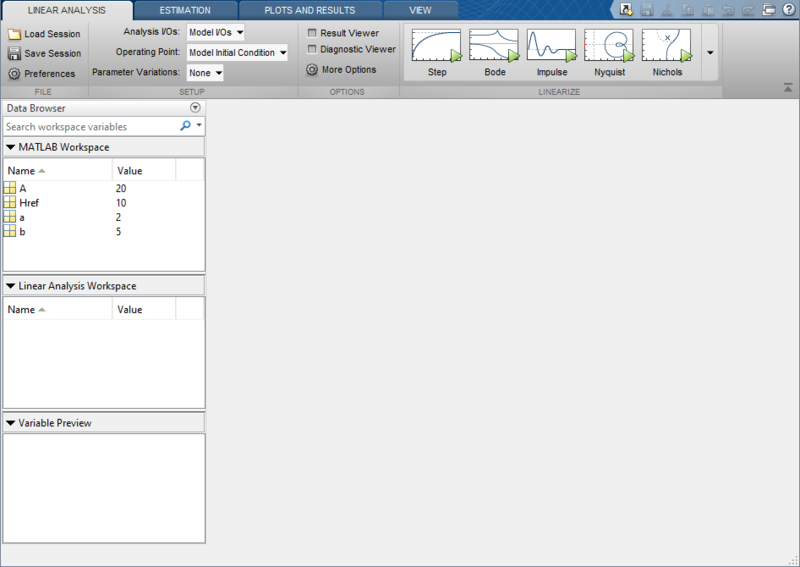 For more information on defining analysis points in a Simulink model, see Specify Portion of Model to Linearize in Simulink Model. Alternatively, if you do not want to introduce changes to the Simulink model, you can define analysis points using the Linear Analysis Tool. For more information, see Specify Portion of Model to Linearize in Linear Analysis Tool. To open the Linear Analysis Tool for the model, in the Simulink model window, select Analysis > Control Design > Linear Analysis. 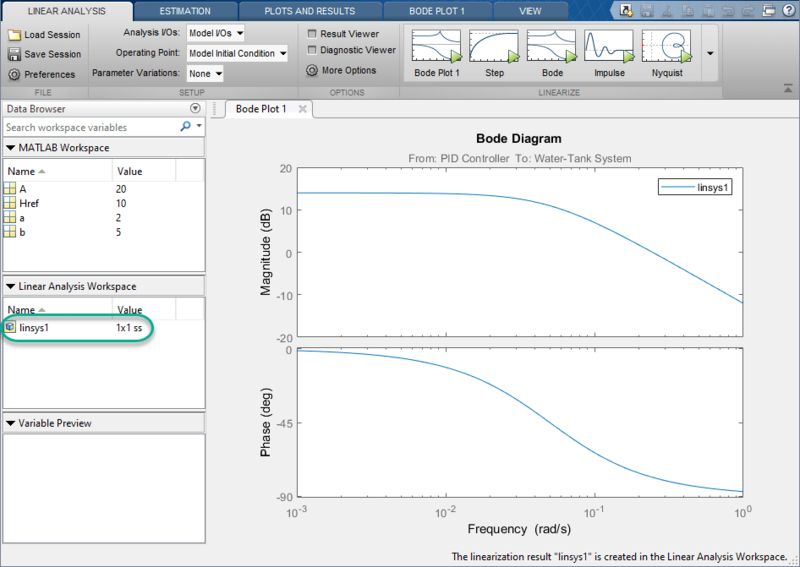 To use the analysis points you defined in the Simulink model as linearization I/Os, on the Linear Analysis tab, in the Analysis I/Os drop-down list, leave Model I/Os selected. For this example, use the model operating point for linearization. In the Operating Point drop-down list, leave Model Initial Condition selected. To linearize the system and generate a response plot for analysis, in the Linearize section, click a response. For this example, to generate a Bode plot for the resulting linear model, click Bode. The software adds the linearized model, linsys1, to the Linear Analysis Workspace and generates a Bode plot for the model. linsys1 is the linear model from the specified input to the specified output, computed at the default model operating point. For more information on analyzing linear models, see Analyze Results Using Linear Analysis Tool Response Plots. You can also export the linearized model to the MATLAB® workspace. 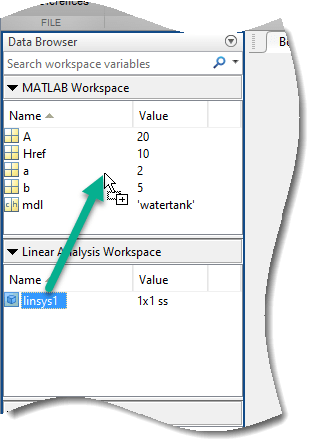 To do so, in the Data Browser, drag linsys1 from the Linear Analysis Workspace to the MATLAB Workspace.